I consider that a man’s brain originally is like a little empty attic, and you have to stock it with such furniture as you choose. A fool takes in all the lumber of every sort that he comes across, so that the knowledge which might be useful to him gets crowded out, or at best is jumbled up with a lot of other things, so that he has a difficulty in laying his hands upon it. Many years after, I watched, even more fascinated, the TED talk from Ray Kurzweil about hybrid-thinking. Twenty years from now, we’ll have nanobots [..]. They’ll go into our brain through the capillaries and basically connect our neocortex to a synthetic neocortex in the cloud providing an extension of our neocortex. In the 2030s, if you need some extra neocortex, you’ll be able to connect to that in the cloud directly from your brain. And our thinking, then, will be a hybrid of biological and non-biological thinking. Every time something to do for me or others comes up to my mind, I immediately enter it in Kyber. It’s an easy habit that gives me the peace of mind of having captured my task and not have to worry about keeping it on my mind, freeing me from that burden. I can add a reminder to it, or make it a calendar event, all in one app. This way, Kyber has become the extension of my brain for all the things I have to do, by myself or with others. Building habits it’s not simple: as described in BJ Fogg’s Behavior model, it’s a combination of motivation and ability. Even when the benefit is obvious (high motivation), the action to be transformed in habit must be simple. We made entering tasks in Kyber fast and intuitive: you can start typing a basic todo, transform it into a reminder just by adding a (start) time and make it an event by also adding an (end) time. All within one interface. Powerful simplicity. But even so, I felt we needed to find an even better solution. Voice recognition and natural language processing have always been fascinating to me: for humans, what is simpler and more natural than speaking? Keyboards, pointing devices and touch interfaces have been just intermediate solutions to the ultimate UX goal: speaking to machines like we do to other humans. That’s why Kyber is fully integrated with Apple Siri. I can simply speak my todo, my reminder or my calendar event and it magically appears in Kyber. The brain offload is now immediate, the benefit is instantaneous, the habit is easily built. After all my tasks are recorded, the intelligence built in Kyber enhances my humanity. 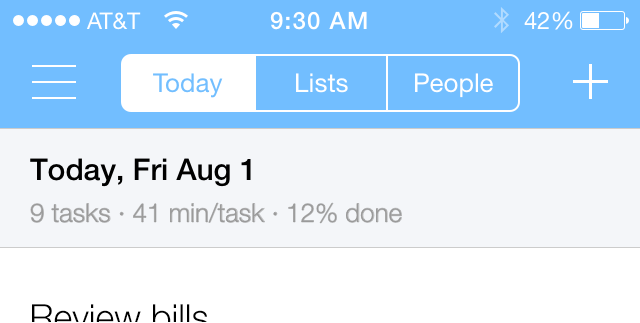 The app analyzes my day and starts telling me how much time I effectively have to dedicate to each task. Common to-do lists have the huge problem of becoming infinite and overwhelming, ironically becoming useless the more we use them. How do we end up with such long lists? Our brain doesn’t calculate (or doesn’t even think about doing it) how much time during the day we actually have available to do stuff, taking in consideration current time, end of the working day and the time we know will be busy in scheduled meetings. If my brain were to do that math, and check the time left to work on those tasks, then maybe it would realize that with current plan I will have only 10 minutes per task, and there is no way I’d be able to finish all of them. That’s why I now rely on the super brain of Kyber to do that math for me – extending my brain – and plan my day to be more efficient. Put in front of reality of having too many tasks planned for today, I start picking, as suggested by the app, the important tasks it’s better to finish today, and I keep “snoozing” (or deleting) those that I would finish tomorrow or later in the week. Now I feel empowered as my plan is doable (20 min/task) and at the end of the day I’ll feel good about what I accomplished vs. being stressed by a long list of remaining tasks that realistically I couldn’t have finished anyway. 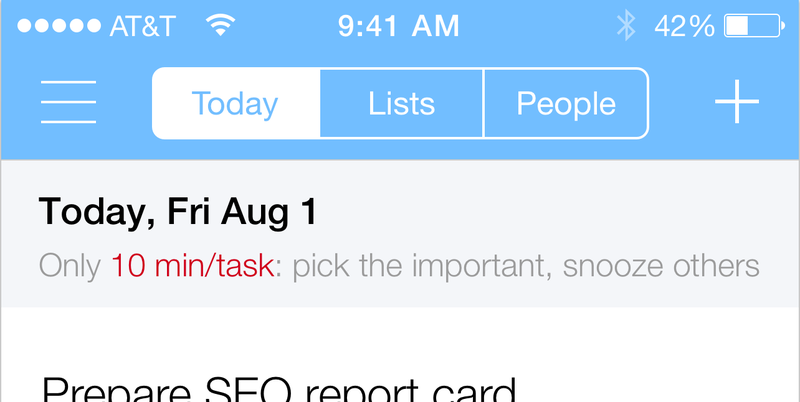 After I picked the important tasks to work on, the app also uses its intelligence to plan the day for me. Is my next meeting in 45 minutes? The app calculates again how many tasks can be done in that period of time – giving me first of all a goal – and then suggests which task to work on next: I’m now more efficient as I know the remained tasks are important (I picked them before), they are doable and I have enough time before my next appointment. Of course we are talking about averages and the estimates might not be accurate. But this approach has another advantage: I now write my tasks breaking them down in actionable sub-tasks instead of generic high level tasks, another GTD recommendation that I’m “forced” to learn just by using the app. We’re going to again expand our neocortex, only this time we won’t be limited by a fixed architecture of enclosure. It’ll be expanded without limit. That additional quantity will again be the enabling factor for another qualitative leap in culture and technology. We will again expand our neocortex over these next decades, and we will experience another qualitative leap as a result. What we are doing with Kyber is of course just the beginning of this journey, but you can start now to get a sense of what it feels to be a super-human or subscribe to get our updates.